Are you planning a visit to the Scottish capital with your kids? Are you wondering if there are many things to do with kids, toddlers and babies in Edinburgh? Well you’ve come to the right place! There is so much to see, do and explore – from museums, to castles, parks, beaches, quirky, fun activities, we’ve got you covered! Having lived in the Scottish capital for almost 12 years, we’ve become very well acquainted with many fun family activities. 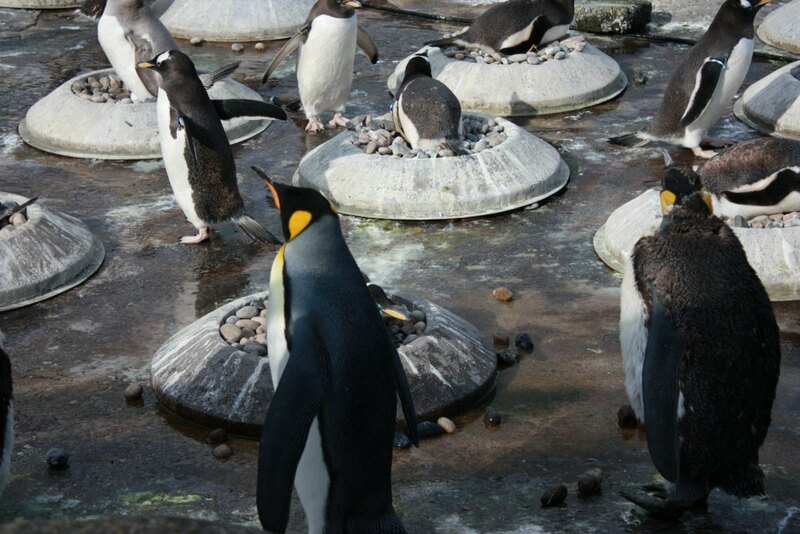 Read on as we share with you some of the best things to do in Edinburgh with kids . 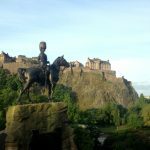 If you’ve come to Edinburgh with kids, there’s a pretty good chance you’re planning a visit to Edinburgh’s famous Castle! 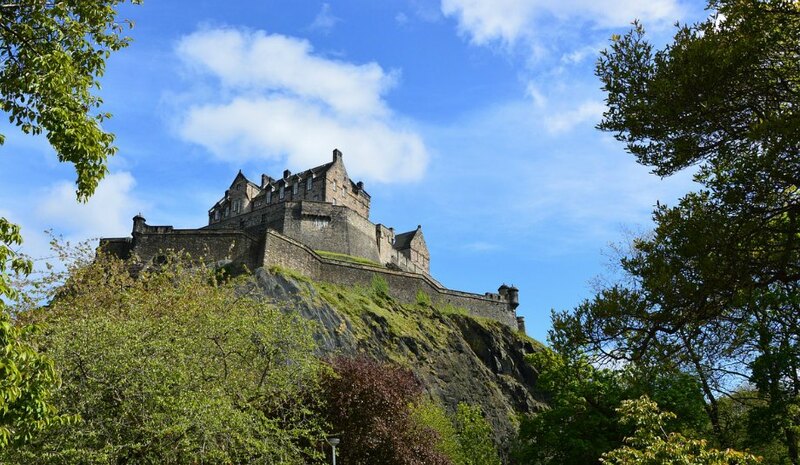 This fortress, which stands proud and imposing above the city, is located at the top end of the Royal Mile and is an incredibly popular tourist attraction. Children will love visiting the Great Hall, the prison, the crown jewels and more. Consider timing your visit to coincide with the 1 o’clock gun – a canon is fired every day at 1pm (apart from a Sunday). Given its popularity (it had broken the 1 million visitors mark by the month of August this year! ), we strongly recommend you book your tickets to the castle in advance. You may also want to purchase an explorer pass if you’re planning on visiting other Historic Scotland site. This pass provides free entry to over 70 visitor attractions and you can choose a pass that’s valid for either 5 or 14 consecutive days. Pick up the children’s quiz to enhance your little one’s visit. It was a real hit with our 9 year old daugher. 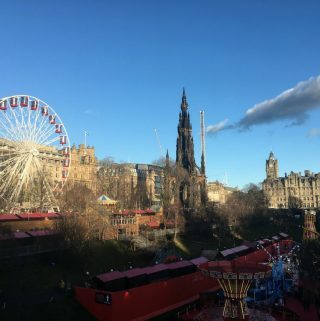 Located just a stone’s throw from Edinburgh castle, you’ll find one of Edinburgh’s oldest attractions, Camera Obscura, which was established in 1835. Kids and grown-ups alike will love this world of optical illusions full of interactive exhibits. It is set over 5 floors and includes a mirror maze, a vortex tunnel and of course the original 165 year old camera obscura. 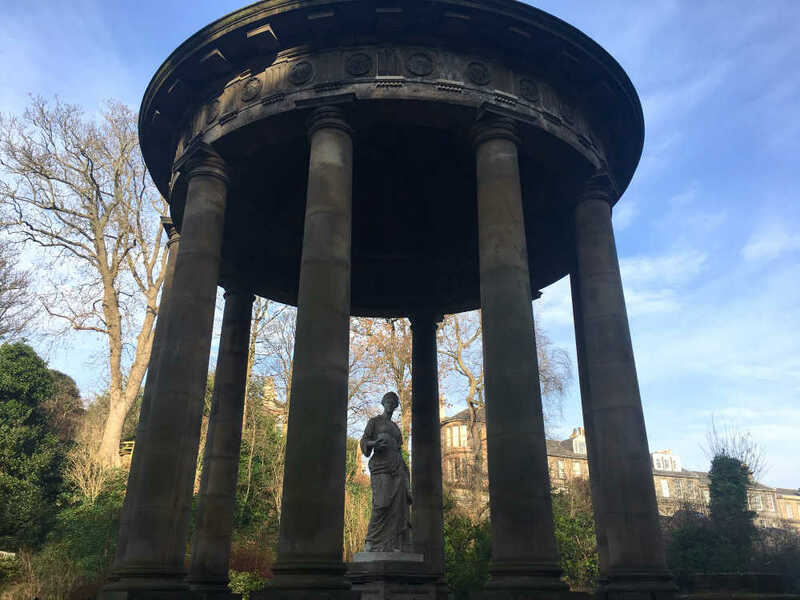 This truly is a must-see attraction in Edinburgh – it’s a great option for a rainy day and it’s a really fun family activity! Good to know: your entry ticket allows you to leave and re-enter as often as you like until close. 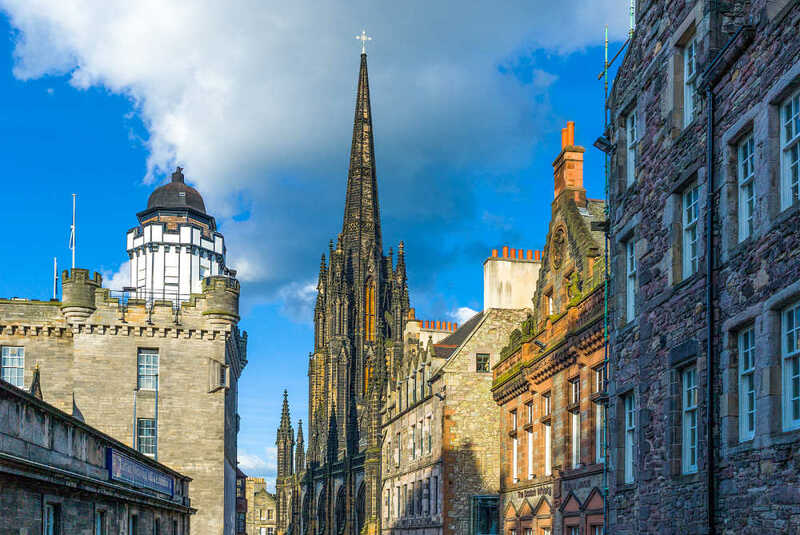 The Royal Mile – which incidentally starts from the castle and Camera Obscura – is a fun street to simply wander along and take in the atmosphere. It is an absolute must during Edinburgh’s Fringe Festival (August) as it’s hive of activity – street performers entertain the crowds the length and breadth of the street. From one castle to another! 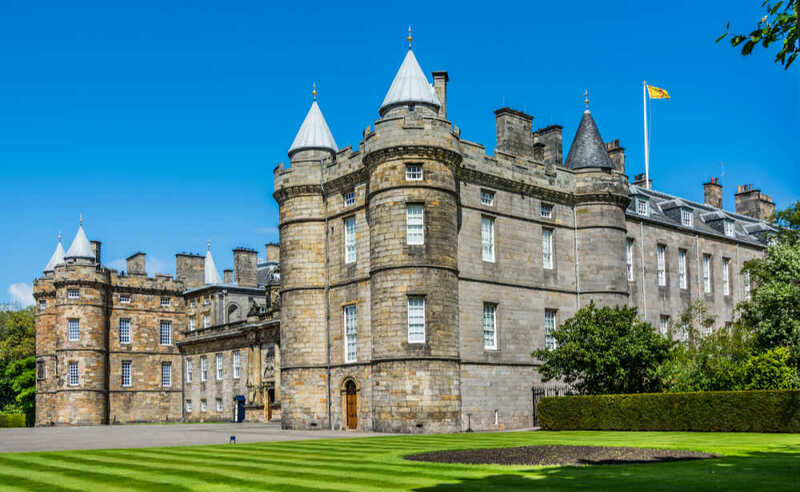 At the bottom of the Royal Mile, you’ll find the Palace of Holyroodhouse, the Queen’s royal residence in Edinburgh. 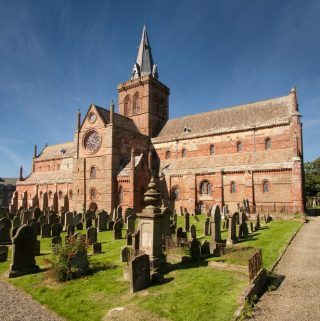 It’s loaded with fascinating history including close associations with Mary Queen of Scots and Bonnie Prince Charlie. Having recently visited, I can confirm that this is a great place to visit with kids! We were lucky to visit just a few weeks after they brought out new multimedia guides for visitors. These guides are included in the admission price and offer either an adult or family tour. We all followed the family guide tour and loved it! There are short video clips, games and quizzes as you move from one room to the next. We discovered that the Great Hall was the same size as two tennis courts and could fit either 75 elephants or 10 double decker buses into it. Children receive a small badge once they have completed the tour – our two were completely engaged with the guide. 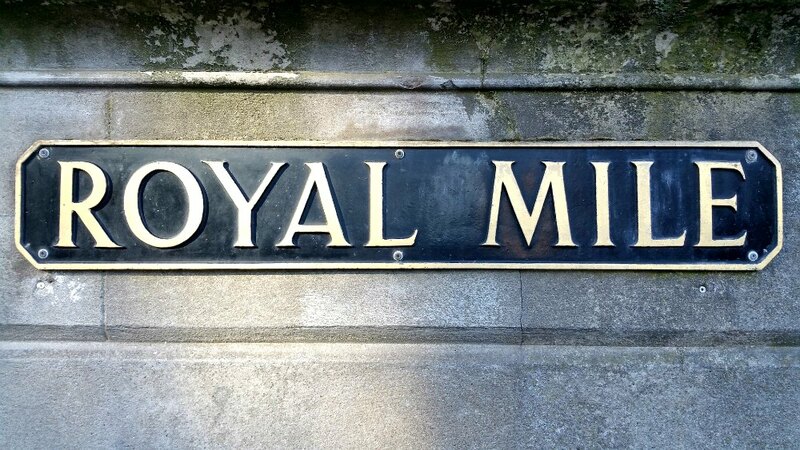 On foot >>> You can easily walk there if you’re in the city centre – simply walk to the bottom of the Royal Mile and you’ll find the Palace, slightly to your right. Bus + car >>> Many of the tour buses stop nearby as well as buses 6 and 35. If you’re travelling by car, you can park in a public car park adjacent to the Palace (it’s located on Queen’s Drive) – it’s free at week-ends! 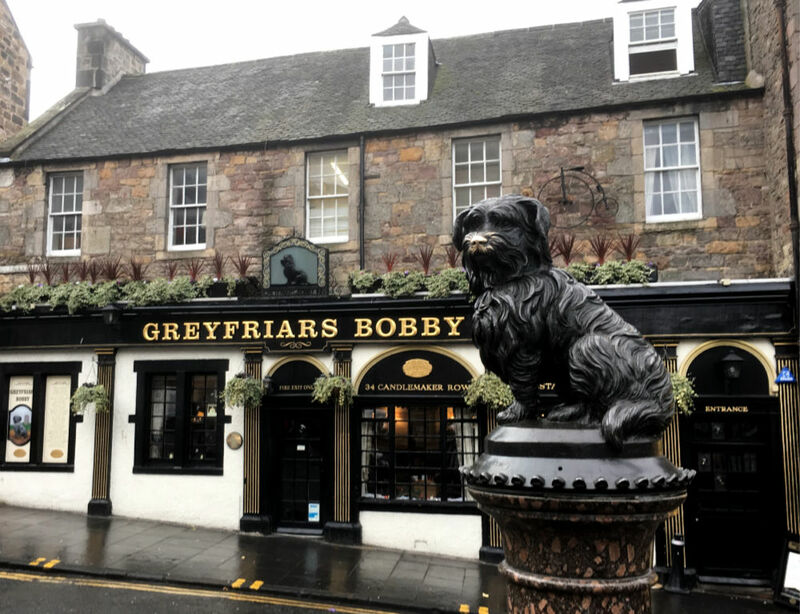 Do you know the story of Greyfriars Bobby? It’s a truly heartwarming tale of a faithful and loyal dog who refused to leave his master’s graveside. Bobby, the Skye terrier, lay on his master’s grave for 14 years, only leaving for food. He died in 1872 at the age of 16 and was buried just 75 yards away from his master’s grave. You can visit his grave with his very own head stone at Greyfriars Kirkyard and there’s a sweet statue of him at the corner of Edinburgh’s Candlemaker Row and George IV Bridge. Check out your library for the book or pick it up here. This is a fantastic museum for children – so much to keep the little minds active and entertained. 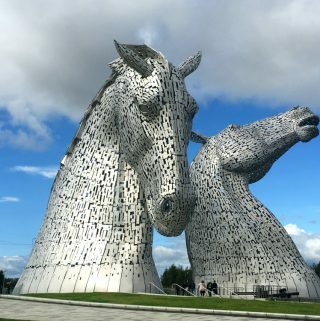 This gem of a place covers everything from Scottish history, to nature, space, transport, art, design, science, technology, fashion, the animal kingdom and more. There’s something for everyone, however, be warned you may struggle to drag your kids away from this place… there’s so much to see and do! Entry is free, however, donations are welcomed. 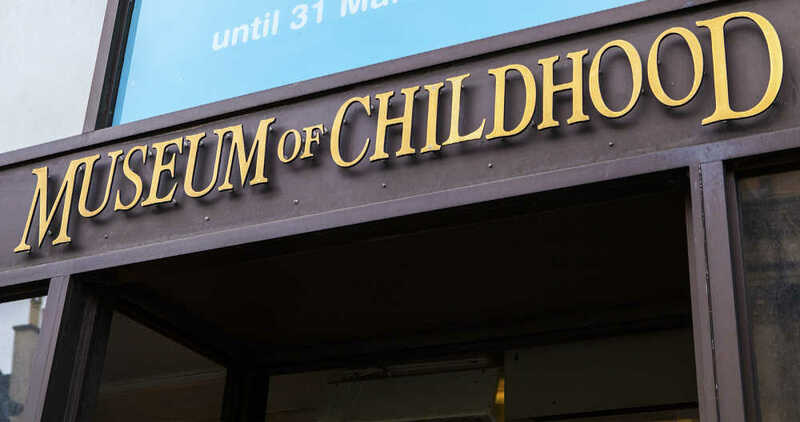 This small, quirky museum located on the Royal Mile is not only fun for the kids but for parents too who’ll enjoy their wee trip down memory lane. There are many toys and books dating back as far as the late 1800s. The ground floor was recently updated and the brand new Gallery One includes many new retro exhibits such as the Fisher Price chatter phone. 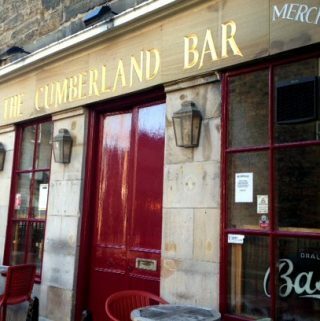 It’s an ideal stop if you’re meandering along the Royal Mile and have a short amount of time to fill. And of course, it’s an ideal rainy day activity and it’s free. 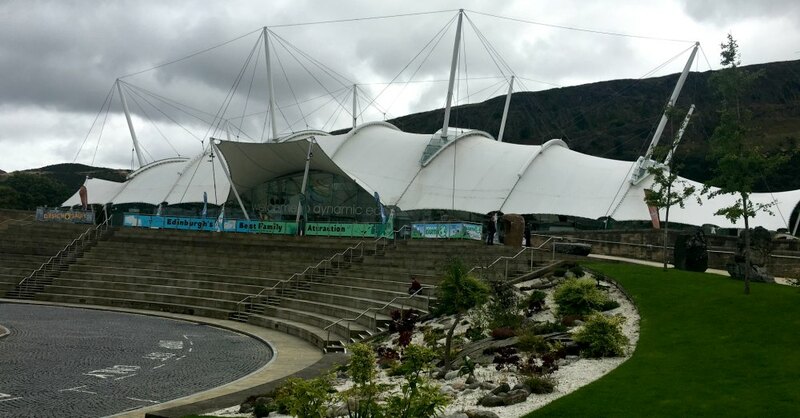 I’ve lost count of the number of times we visited Dynamic Earth as we used to have a yearly membership. This is a fantastic place for children (and adults) of all ages. You’ll embark on a journey through time and space where you’ll learn all about our planet earth – how it evolved from the Big Bang to present day. There are plenty of interactive exhibits and fun ‘rides’ including time travel on the Deep Time Machine, a ride on the Endeavour spaceship and much, much more. You’ll get 10% off if you book your tickets online. There’s an underground car park which is underneath Dynamic Earth and can be accessed from Holyrood Gait, however, if you can, we recommend walking. 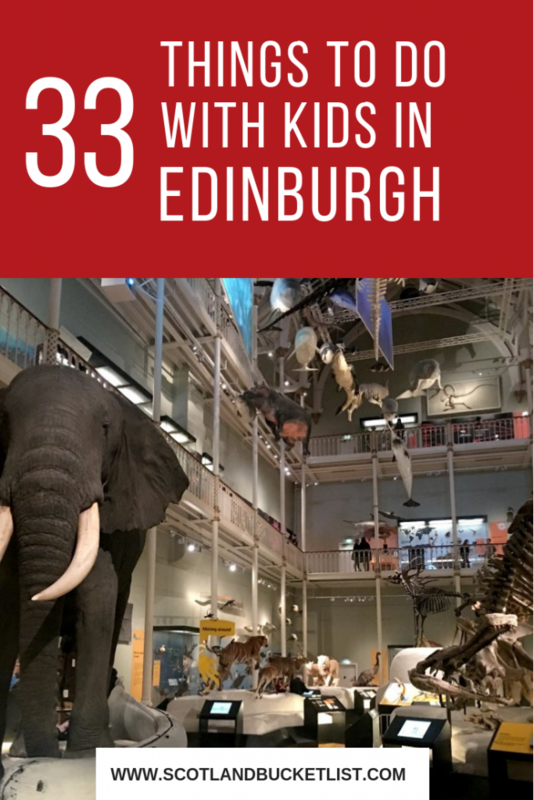 Okay, this isn’t technically a museum but this definitely a must if you’re visiting Edinburgh with kids! 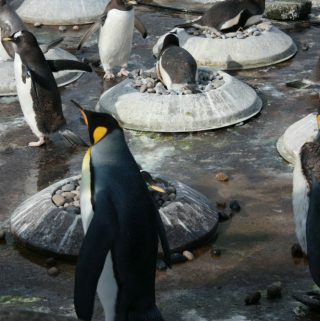 Jump on bus 12, 26 or 31 from the city centre and head out of town to Edinburgh Zoo. It’s heavily involved in conservation work and you will only find protected species in the zoo. Your kids will love the Giant Panda exhibit and the world famous Penguin Parade. It’s mostly set on a hill and so can be quite tiring for little legs. Buy your tickets online to save queuing up on the day and to benefit from an early bird discount. Book at least 3 days ahead of your visit to benefit from the best discounted rate. If you’re looking for some quirky, unique and fun things to do with kids in Edinburgh, then here are some suggestions that go beyond the castle and museums. 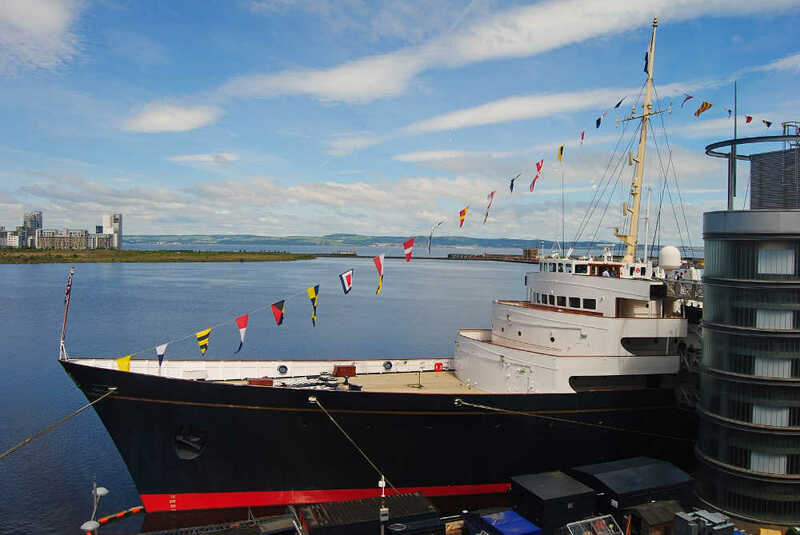 The Royal Yacht Britannia is the actual boat that the Queen used to sail in around the world – a floating home to the royal family for 44 years. It has now been safely moored at the Ocean Terminal, about a 10-15 minute drive from the city centre, for quite a number of years. We visited it when it first opened and we loved it – it gave a fascinating insight into the royal family and a bygone era. Your kids will love checking out the 11 foot LEGO replica of Britannia. You’ll also be given a complimentary audio-guide which will greatly enhance your visit. To get there, either drive and park in the free Ocean Terminal car park or catch public transport (buses 11, 22, 34, 35 and 36) or use one of the hop-on hop-off tourist buses. A farm within the city, how cool is that? This small farm, located about 2 miles from central Edinburgh, is a gem of a place. 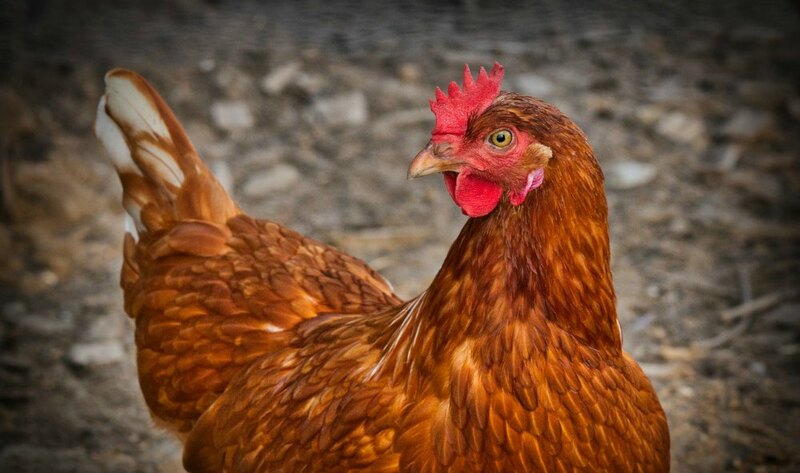 Gorgie City Farm opened in 1982 and has been run as a working farm ever since then, selling eggs, vegetables, lamb and pork to help cover some of its running costs. There are pigs, cows, chickens, sheep and goats on the farm. Why not bring history to life and take your kids on a walking tour? Our kids are often reluctant to go on walking tours but with a bit of cajoling, they end up absolutely love it. The guides have a wonderful ability to bring the subject to life and engage the children. 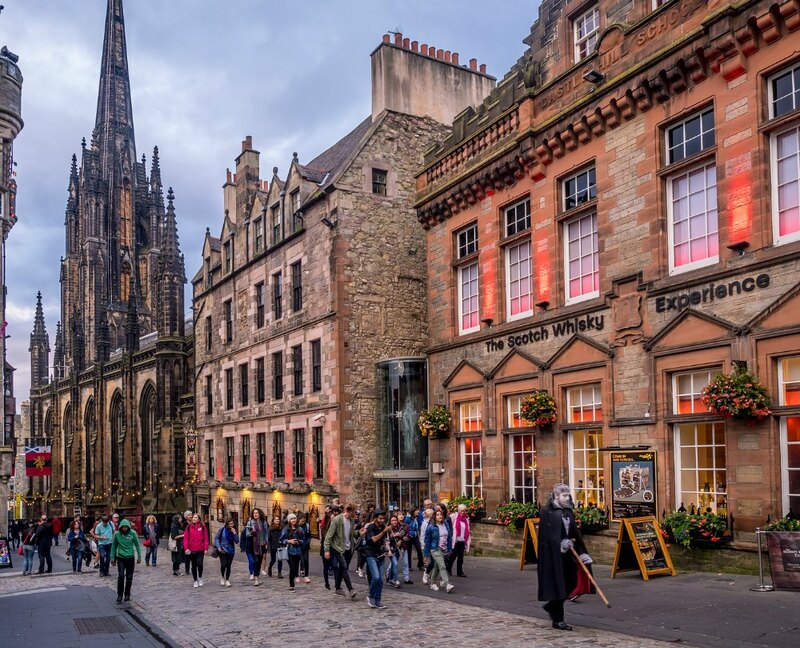 The guided tours in Edinburgh that are most likely to capture your kids’ attention are probably the Ghost Tour or the Harry Potter tour for the HP aficionados! You can’t fail to notice the tall spire that dominates the Edinburgh skyline along Princes Street. It’s called the Scott’s Monument and is one of the largest monuments dedicated to an author – in this case, Sir Walter Scott. It’s fun to climb the many stairs to the top where you’ll get a great view of Edinburgh city centre. It’s steep and narrow the further you get to the top. It’s worth noting that it does come with quite a hefty price tag at £8 per adult and £5 for kids, however, it is a true iconic building and one of a kind. Tip: you may wish to give it a miss if you’re scared of heights or claustrophobic! This isn’t for the faint-hearted and is only really suitable for children from the age of 8 upwards. The Edinburgh Dungeon is an underground tourist attraction in Edinburgh’s city centre, on East Market Street. There are professional actors who do a great job of freaking you out! They bring the darkest of Scottish history to life through fantastic shows, special effects and rides. We recently took our 11 year old (who LOVED it!) and he definitely felt his younger sister – aged 9 – would have been very spooked by the experience so be aware of your child’s sensitivities before booking on this tour. Now for something you won’t find in the guidebooks. Why not join in with the locals and sign your kids up to a junior park run! What is a junior park run I hear you say? Well it’s a 2km run for juniors only, aged between 4 and 14 years of age. It’s completely FREE and takes place in both Inverleith Park and the Meadows. You will simply need to register online and take the printed copy of your barcode along on the day. They also offer adult 5km park runs which take place on a Saturday morning. 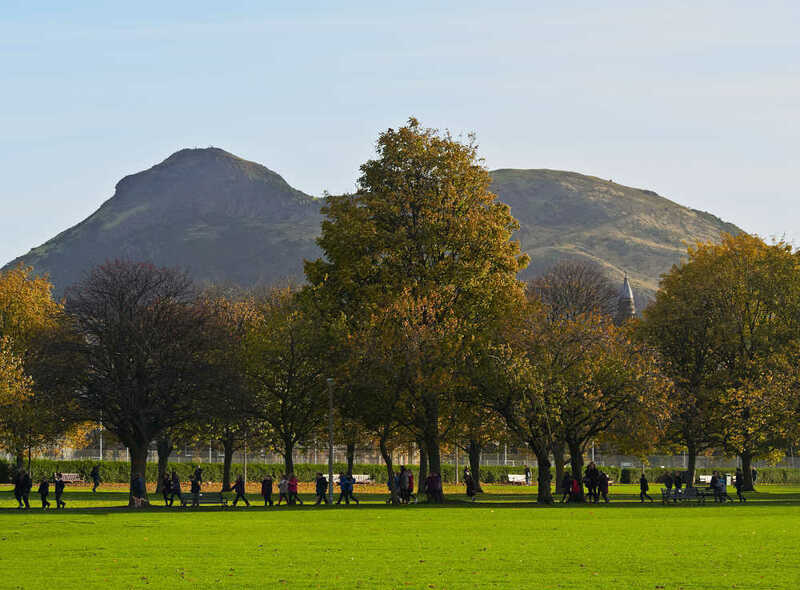 The Meadows Junior Park Run: every Sunday at 9:30am in The Meadows Park. Enough of tourist sites I hear you say? Time for some fun exercise? Well this is just the place for you – trampoline to your heart’s content. Check the online schedule to be sure that there are no classes when you plan to visit. A trip to the cinema? What’s quirky or unique about that? Well, you’ve never been to the Dominion cinema have you? This is a wonderfully quirky art deco 1930s style cinema in the Morningside area of town and is something of an institution in Edinburgh. Enjoy your film viewing whilst relaxing in a lovely comfortable sofa. Choose the first class experience where you’ll be sat in reclining leather sofas and served drinks in glasses and your nachos or popcorn in proper bowls. Be warned though, other cinema experiences will never be the same again, lol. And if you’re now thinking that a trip to the cinema might a good idea, here’s a list of the other main cinemas within the city centre. The Filmhouse – this is an arthouse cinema that offers world cinema screenings as well as many indepedent films. There is a great vibe in the bar area if you fancy grabbing a quick bite before watching your movie of choice. Vue Cinema at the Omni Centre or at the Ocean Terminal. Cineworld Cinema in Fountain Park. The Odeon on Lothian Road. 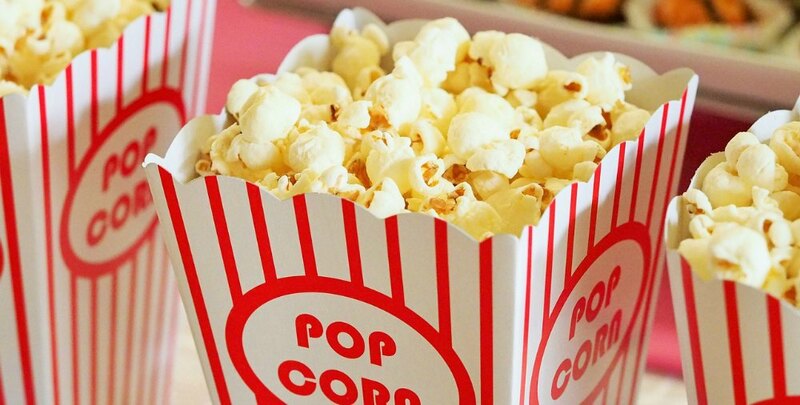 TIP: And don’t forget that many cinemas offer cheap weekend morning showings (VUE cinema or Cineworld) from £2 and baby screenings (this is a baby and carer screening which is limited to babies under 12 months accompanied by no more than two adults). 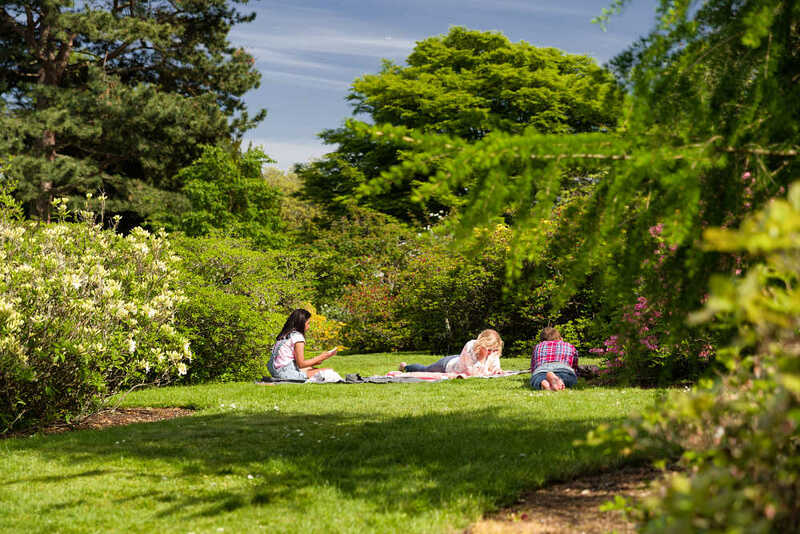 Edinburgh’s Royal Botanic Gardens – perfect space to relax, unwind or run around and let off steam! If your kids are getting fed up with being dragged round yet another museum or another old building and simply need to let off some steam, then why not head to the nearest playground. Edinburgh has plenty of green space and there are several playgrounds and parks dotted throughout the city. Here is our pick of the best across Edinburgh. One of the best playgrounds in Edinburgh! The Meadows playground is definitely one of the best! 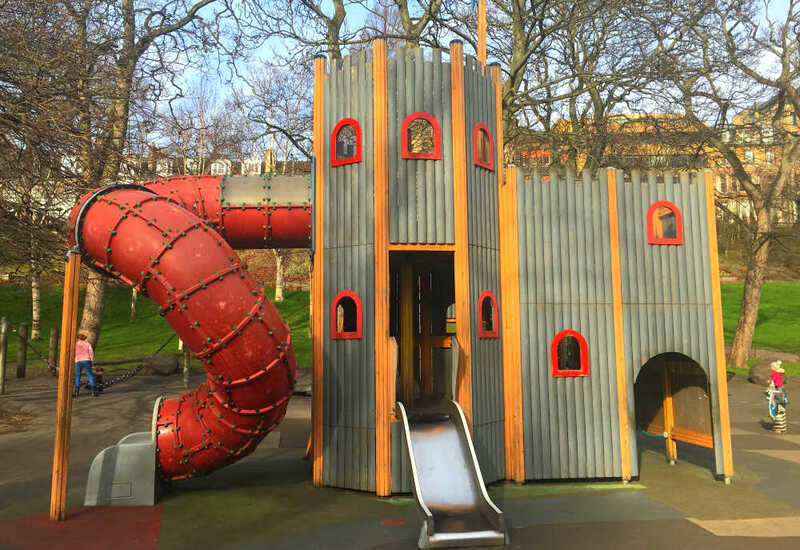 This is one of the largest playgrounds in Edinburgh and it even includes a flying fox (adults can have a go too… go on, you know you want to!). It’s set in the east end of the famous Meadows park and cater to all ages, from toddlers to teenagers, and includes a swings, slides, climbing rocks, sand play. TIP: Parking can be tricky so walk there if you can. 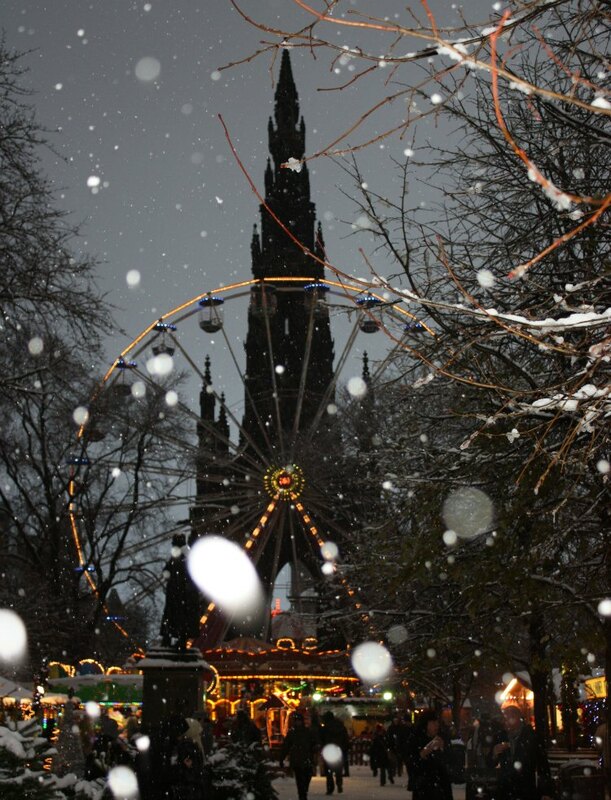 The fantastic playground at the west end of Princes Street Gardens. 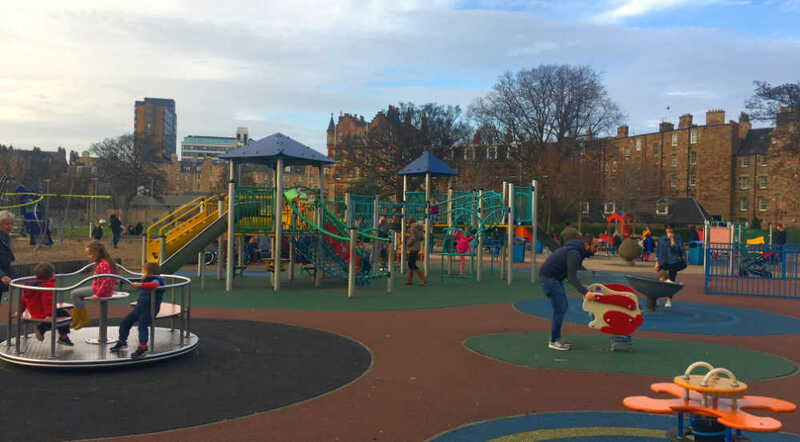 If you’re in the city centre and your kids are fed up with traipsing around, then why not let them burn off some energy in Princes Street Gardens playpark. It’s located at the west end of the Princes Street Gardens under the shadow of the iconic Edinburgh castle. There’s a large fountain nearby if the weather happens to be good and they fancy cooling down! The gardens are lovely and give an impression of being in the countryside despite being right in the middle of the city. Plenty of opportunity for kids to burn off some steam! Ooh arrr, me heartie! On the north side of the city about 20-25 minutes from Princes Street, you’ll find Inverleith Park. Here you’ll find a fantastic children’s playground, 3 football, 4 rugby and 6 seven-a-side pitches, a cricket square and a petanque area. Don’t miss the pond where you’ll often find old boys (and young) testing their model boats. 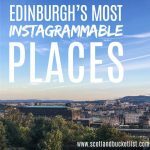 Inverleith Park is right next to the Royal Botanical Gardens and is an absolute must visit. It’s a great spot to escape the hustle and bustle of the city. Again, there is plenty of space for kids to run around, chase each other, do cartwheels, etc. There is a large Glasshouse which houses all kinds of tropical plants. You’ll also find a Japanese garden, a large visitor centre, the John Hope Gateway Centre and a lovely child-friendly café – The Terrace Cafe – with one of the best views of the Edinburgh skyline. Buses 8, 12 and 23 will drop you outside the beautifully ornate leaf gate at the East Entrance on Inverleith Row. TIP: Don’t miss the view of the city from the Terrace Café. It’s an incredibly child-friendly café with a play corner and a lovely choice of food/snacks for kids. If you happen to be visiting in December, do not miss the magical winter light trail evenings at the Botanics. 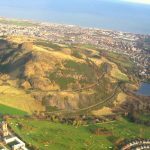 A run around Holyrood Park might be enough for younger kids but if you have older children or your little ones are good walkers, then consider taking them for a hike up Arthur’s Seat, Edinburgh’s extinct volcano. 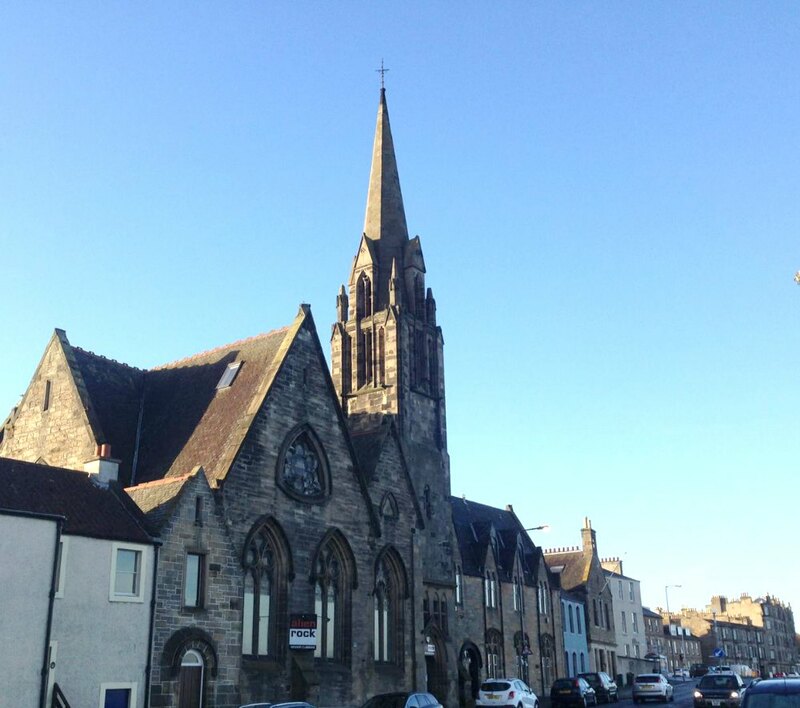 It is situated east of the city centre and can easily be reached from the bottom of the Royal Mile. You’ll find Holyrood Palace when you reach the end of Royal Mile and from there you can’t fail to see the large hill to the right. Once at the top, you’ll enjoy some fantastic views of the city and the sea (Firth of Forth) in the distance. It’s about a 40 minute walk up to the summit or if you decide to walk round, it’ll take a good hour. There’s a pretty good chance it’ll be ‘blowing a hoolie’ at the top so dress accordingly! Check the maps onsite to pick the route up as there are a number of different paths. 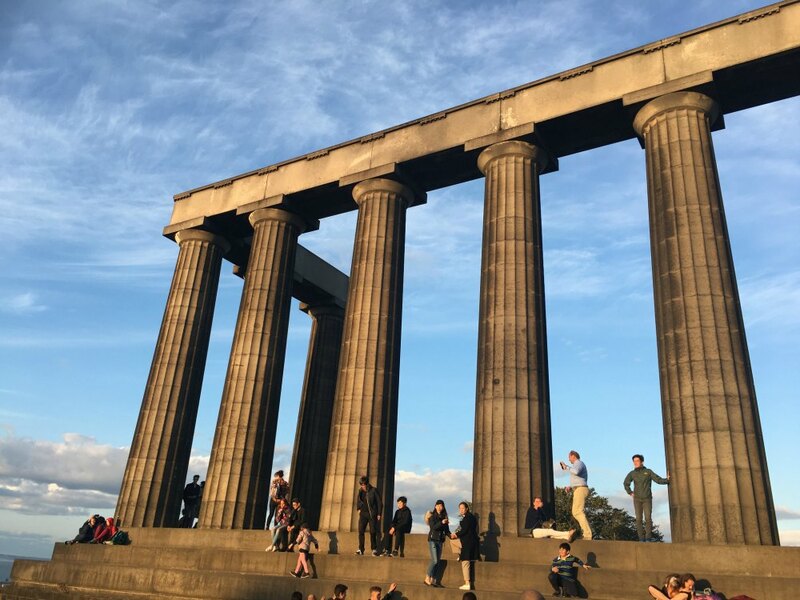 Calton Hill is another fantastic place for kids to let off steam and as a bonus you’ll get some of the ultimate best views of the city! 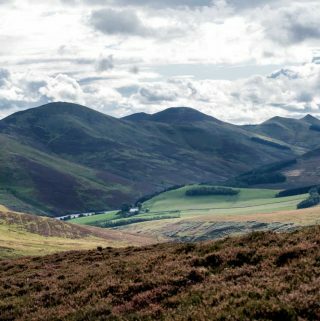 When you reach the top, you’ll be rewarded with amazing views to the Firth of Forth, Arthurs Seat, the port of Leith, the Pentland hills and of course right down Princes street towards the castle. Calton Hill is also home to several unusual monuments including the national monument which looks like it was built by the Romans. It was in fact built in 1826 in memory of soldiers and sailors that died in the Napoleonic wars. It was meant to be a replica of the Parthenon in Athens but was sadly was never finished as funding dried up before it was completed. TIP: This is a great place to get some fun family snaps! Getting there: Finding your way there can be a little tricky. You can access it from a staircase and winding tarmac path at Waterloo Place/Regent Road or from Royal Terrace on the north side. St Bernards Well close to Stockbridge along the peaceful Water of Leith. This walkway, just a short distance from the city centre, is great option for families visiting Edinburgh. The Water of Leith runs from Balerno to Leith covering 12 miles. There are many points of entry along the walkway. We love to join near Dean Village and to walk to the Gallery of Modern Art. 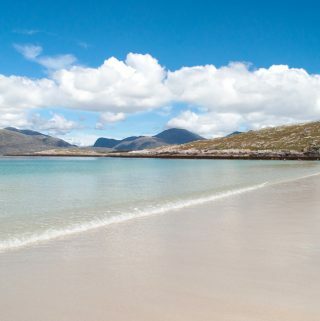 And if you fancy a change from the city and have a car, head to one of Edinburgh’s nearby beaches. 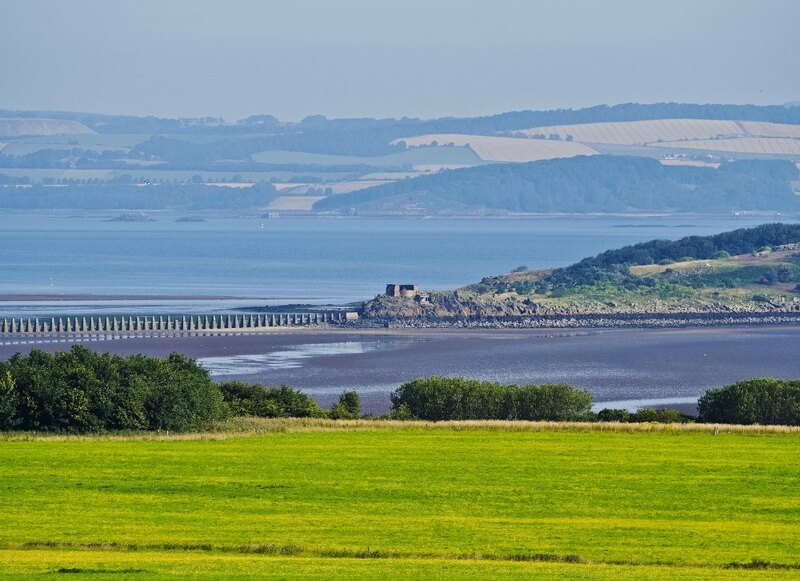 Cramond is a lovely coastal village about 20 minutes Choose between a river or sea front walk at Cramond and if you time it well, you can even cross over to Cramond island at low tide. There’s a lovely café by the waterfront where you can stop for cuppa. 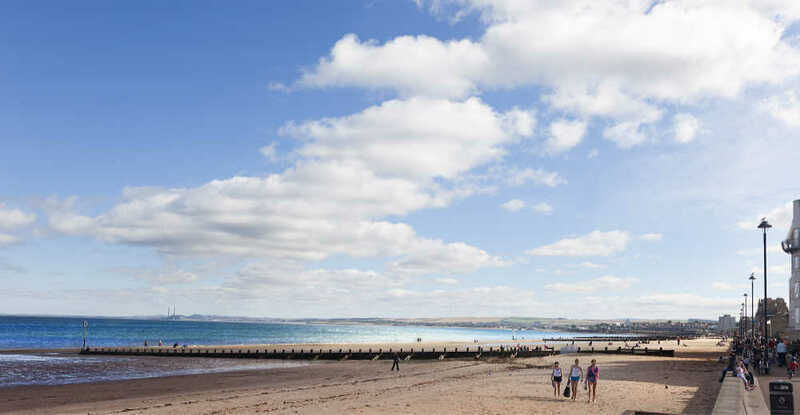 Portobello beach is located just a few miles from Edinburgh city centre and can be reached by car or by bus (no 26, 124 or 113). This seaside suburb, popular with the locals, has a lovely two mile stretch of beach where you can swim or sunbathe – weather permitting of course! There is also a great promenade where you can walk, cycle, run, roller-blade or stop off for a coffee and cake. 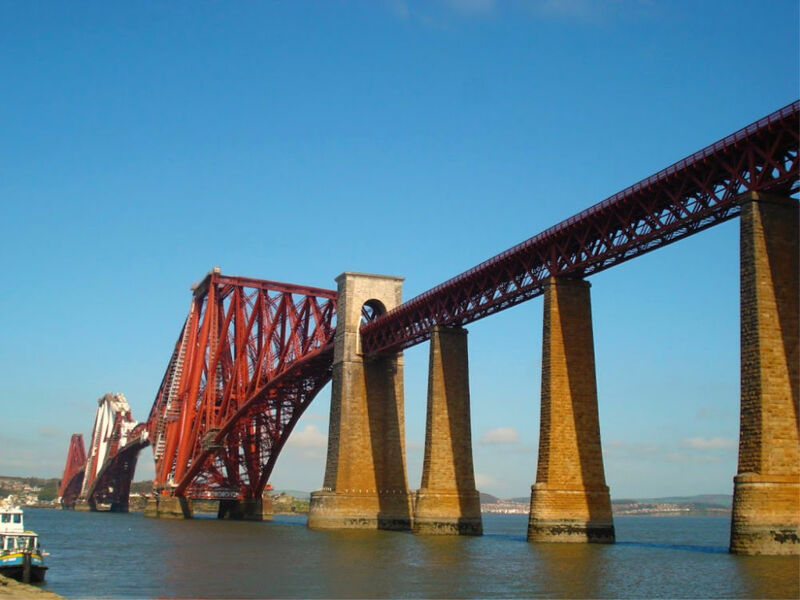 If your kids are into trains, head to South Queensferry where you will get an amazing view of the iconic Forth Rail Bridge. You can also take a boat trip across to Inchcolm Island and check out the Abbey. South Queensferry is a very cute coastal village and takes around 30 minutes to reach from Edinburgh city centre. Love them or loathe them, soft play centres or indoor parks can be a good option for rainy days! It’s also a chance for mum and dad to (kinda) relax, have a coffee in (relative) peace and enjoy the chorus of screaming kids, lol. This is a great option if you’re planning a visit to Royal Yacht Britannia. If you’re little ones are needing a little encouragement for visiting yet another tourist attraction, you could perhaps reward them with a session at the Ocean Play centre. It’s located in the Ocean Terminal and even overlooks the Britannia Bay. Clambers is a lovely softplay suitable for babies to kids up to age 10 at the Royal Commonwealth Swimming Pool. You can combine softplay with swimming at this great venue. As the name suggests, the pool was built for the Commonwealth Games and is one of very few 50 m pools in Scotland. This is one of the largest softplays in Edinburgh and it’s situated in the heart of Leith. You’ll find something for every age from ball pits in the baby zone, to volcano slides, small go-karts, trampolines, climbing areas. Are you looking to find out what’s on in Edinburgh for kids? Well we have a real local insider’s tip to share with you. 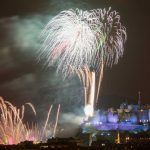 Check out this fantastic website dedicated to all the activities, events and shows that are on in Edinburgh. The King’s Theatre – a must in December for their legendary pantomime! 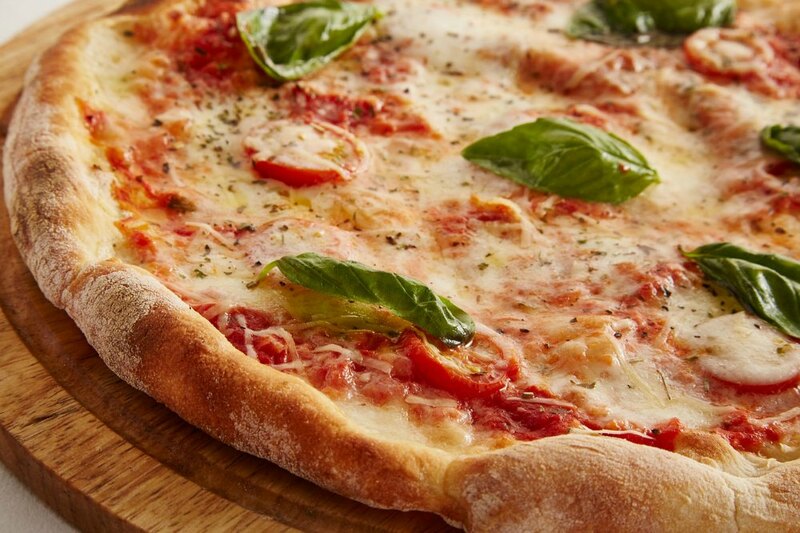 There is plenty of choice when it comes to eateries in Edinburgh! Here’s a small sample of some of our favourites – we’ll keep adding to the list and please feel free to leave your own suggestions in the comments. Hard Rock Café. Not typically Scottish but a fun experience nonetheless! 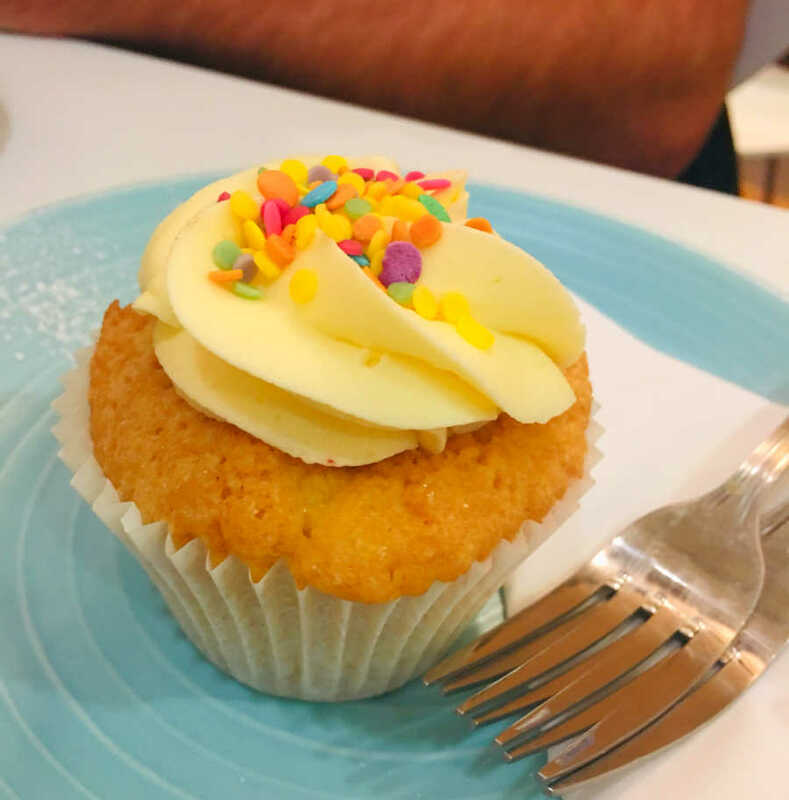 Indulge in a delicious cupcake from Mimi’s! 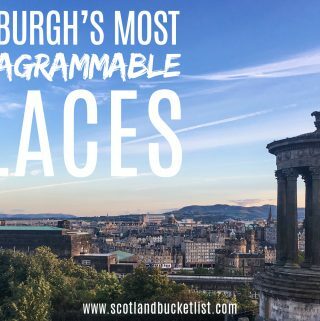 One of the many great things about Edinburgh is its size – it’s very compact, easy to get around and you can walk to most places within the city centre. However, little legs might get tired and require a break so why not turn getting around the city into an exciting adventure? If you’re coming from outside of the UK, there’s a good chance you might not have double-decker buses so why not add this to your kids’ bucket list and let them ride atop through the city centre! Here’s a link to Lothian bus journey planner or download their app to check bus routes and timetables. Be aware that (frustratingly!) you need to have the right change for your bus fare when you jump on a Lothian bus. The tram is a fun alternative to the double-decker bus and if you’ve arrived in Edinburgh by plane, you could easily catch the tram from outside the airport and head all the way into town. The adventure starts from the word go! The tram doesn’t cover as much ground as the extensive network of buses, however, it’s a fun ride nonetheless. The tram line runs from Edinburgh airport to York Place – check their website for timetables and fares. A cab is another word for ‘taxi’ and you’ll find many of the iconic ‘black taxis’ in Edinburgh. Why not treat your kids to a ride in one of these unique taxis? You can flag them down, head to a taxi rank, call them or download their app. You may be short on time and are wanting to fit in as much as possible on your whirlwind tour of Edinburgh. If like us, dragging kids from A to B can be a time-consuming affair, then consider catching the Hop-on Hop-off tour bus. 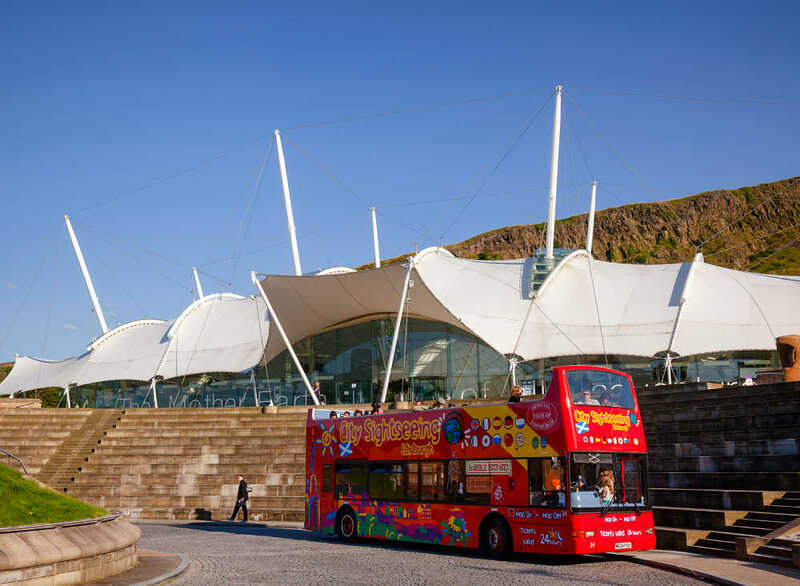 We have the *perfect* option for you – the red CitySightseeing Edinburgh Bus Tour because, get this… the children’s commentary is a Horrible Histories’ narration by Terry Deary himself! ‘Horrible Histories’ is a fantastic British children’s TV show that presents history in a very fun way – as they say in the show, it’s ‘history with all the gory bits left in’! 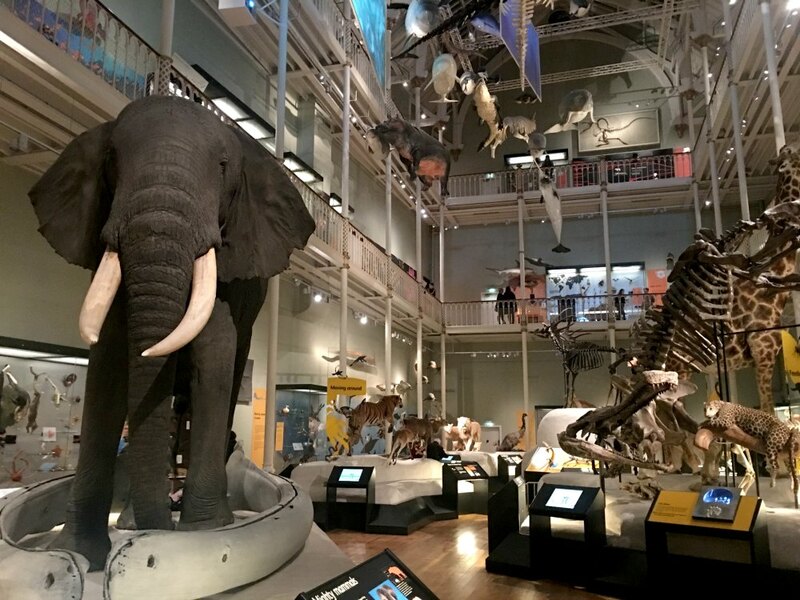 There are many places to take children outside of Edinburgh and we could certainly dedicate an entire post to this, however, in the meantime, here’s a small snapshot of some of the things to do near Edinburgh with kids. 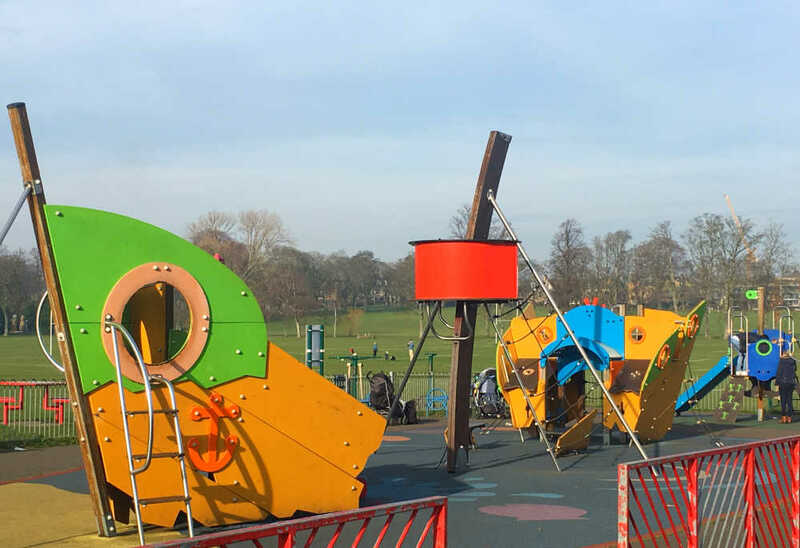 Located a short 20 minute drive to the South East of Edinburgh, Dalkeith Country Park is a great spot to spend an afternoon and discover the recently updated Fort Douglas play park. This fantastic adventure playground caters to all ages and includes an amazing treehouse fort, swings, zip slides, rope bridges and lofty walkways (check their website for entry prices to the Fort). Your kids won’t be disappointed! There are also various short and medium walks around the grounds. If you’re hungry then be sure to check out the recently transformed 18th century Stableyard and Courtyard which is now home to the Restoration Yard Café. Jupiter Artland is located on the outskirts of Edinburgh (technically in West Lothian), however, it’s well worth the detour if you have the time and transport. It’s a contemporary park showcasing art installations, a woodland art trail, grass sculptures and more. There’s also a lovely teashop if you need to refuel at any point. It’s only open from May to September so check their website before you head there. How about something a little different? Have you ever been fruit picking with your little ones? 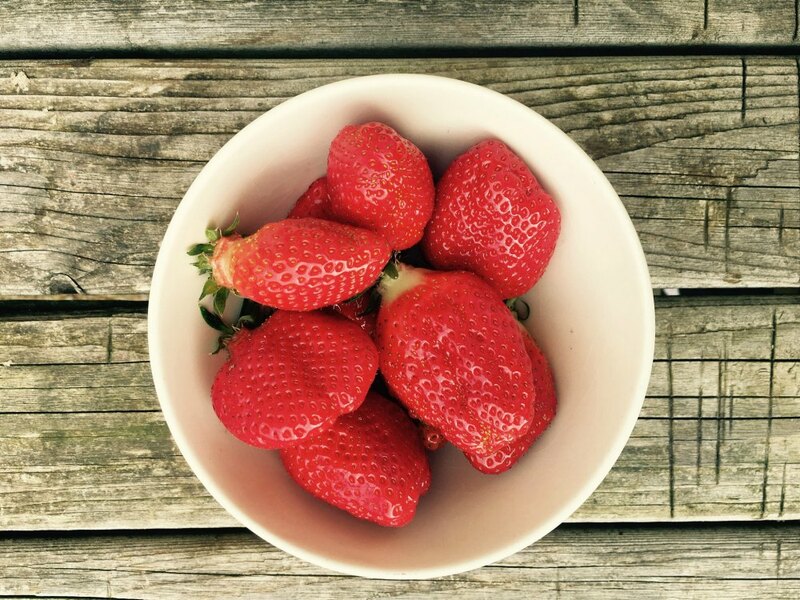 Well here’s your chance… Craigie’s farm offers you the opportunity to pick strawberries, raspberries, cherries, apples and even pumpkins at various times in the year! So much fun for the whole family. You simply pay £3 per person for a basket and off you go fruit picking. 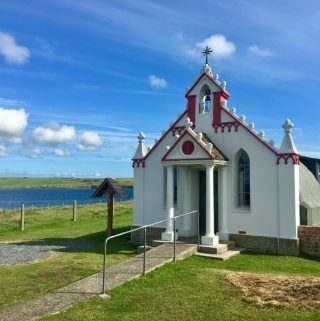 There’s also a lovely outdoor children’s play area, a great café, fantastic views to sea as well as some farm animals onsite. It’s close to the airport so as an added bonus your kiddos can do some plane spotting. The fruit picking is best in the summer when most of the fruits are in season, however, be aware that it does get busy. Almond Valley Heritage Centre was a firm favourite with our kids when they were younger. It’s located in the nearby town of Livingston about half an hour’s drive from Edinburgh. It’s a fantastic site with plenty of indoor and outdoor activities for children including a museum, onsite farm animals, pedal carts, tractor rides, trampolines, playgrounds and there’s even an indoor softplay area.